As if I didn’t already think about food enough (at least 50 percent of what I write for magazines deals with food in some way) I’m pretty sure I’ve been dreaming about it lately. Not that I’m complaining. Wednesday night I dreamed about this recipe. 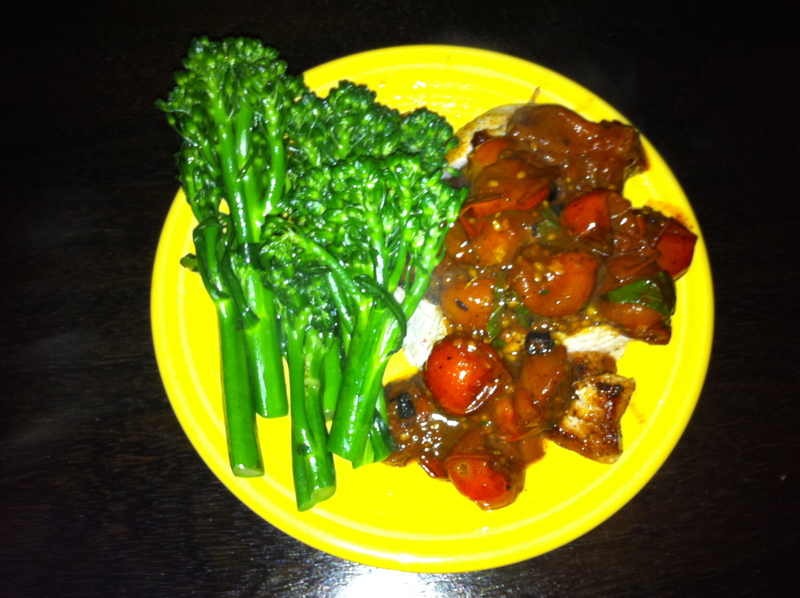 It’s no wonder how the chicken and tomato-herb pan sauce made their way into my dream to begin with: I’ve looked at it about a dozen times in the past week on this blog and have checked out similar recipes on a variety of different blogs, too. But here’s the miracle to end all miracles: I had nearly all of the ingredients already on hand from my grocery shopping trip on Sunday (which I did sans list…shh don’t tell anyone). That was five days ago. Okay, maybe it’s not fate, after all, that these delicious ingredients were hanging out in my fridge all week…perhaps I subconsciously swiped them up while shopping because I had studied (yes, studied) the recipe so many times. Whatever caused those ingredients to appear in my refrigerator and in my dream, one thing was for sure: I had to make it last night. While I didn’t have every single ingredient (that would have really been a miracle), I had the basics and used what else I had (fresh basil instead of oregano; sauvignon blanc instead of chicken broth) to make my own version of it. And it ruled. Among its many wonderful qualities (taste being numero uno) was the fact that it was fast. It took me no more than 20 minutes—start to finish—to whip up after I came home from hot yoga yesterday evening. In a small bowl, combine the butter, garlic, oregano, and paprika. Season with salt and pepper. Set aside. In a large skillet over medium-high heat, melt 1 tablespoon of the seasoned butter with the olive oil. While that heats, season both sides of the chicken breasts with salt and pepper. Place the chicken breasts in the skillet and cook until golden brown on each side and cooked through. Transfer to a plate, cover with foil, and set aside. Increase the heat to high and add the tomatoes to the same skillet. Cook, stirring occasionally, until the tomatoes begin to char and burst, about 5 minutes. Add the remaining butter mixture to the pan. Add the basil. Crush the tomatoes slightly and continue stirring until the butter is melted. Add the wine to the pan, scraping the bottom to loosen the browned bits. Cook until well blended and a reddish-caramel colored sauce forms. Slice the chicken, transfer to serving plates, and top with the pan sauce. Remove tough ends from broccolini. Bring a pot of water to a boil. 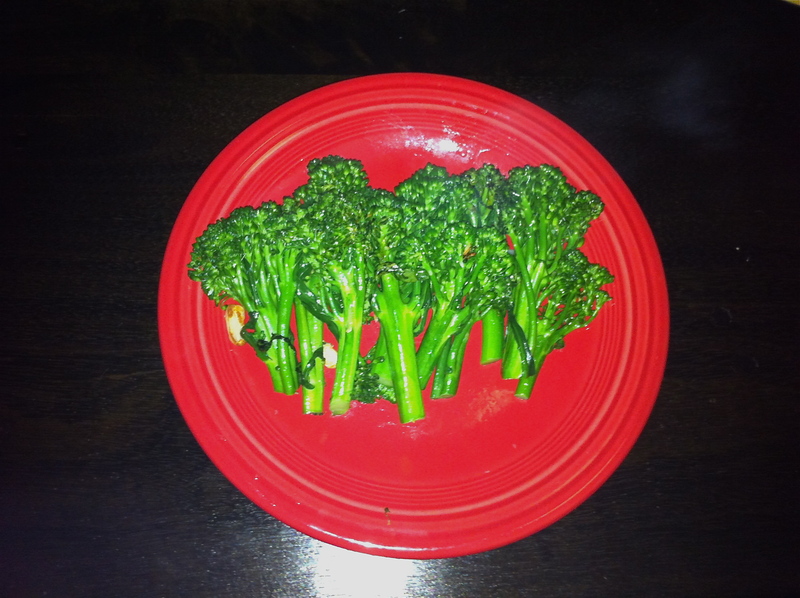 Once it’s boiling, drop the broccolini in and cook for about one minute—until the stalks turn a radiant green hue. Drain in a colander. Heat olive oil and garlic in a pan on the stove. Once the garlic starts to brown, add the broccolini and sauté for about 3 minutes. Remove from pan and serve. This entry was posted in Chicken, Vegetables on September 16, 2011 by Paige Greenfield.